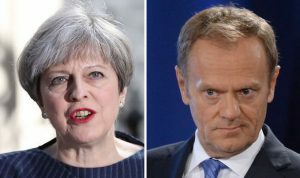 EUROCRATS applauded Theresa May’s decision to hold a General Election on June 8 through gritted teeth and warned they would try to influence voters to protest against Brexit. Donald Tusk (pictured below), the European Council president, bizarrely compared the move to the plot of a horror film and confirmed it had stunned the Brussels bloc. A senior EU official hinted Eurocrats had been planning to use the Brexit uncertainty in British Parliament as a bargaining tool and admitted it would protect Mrs May from those who insist a deal must leave the country worse off. German foreign minister Sigmar Gabriel said it would bring “clarity and predictability” to talks with the EU. The Conservatives enter the election campaign with a commanding lead in the opinion polls, by contrast Labour are at their lowest level since Gordon Brown was in power. Czech MEP Petr Jezek, from the Alliance of Liberals and Democrats for Europe, joked that Mrs May had announced the “date of Jeremy Corbyn’s departure”. Guy Verhofstadt, the European Parliament’s Brexit negotiator, reportedly, believes politicians on the continent will seek to influence the election.